Compatible with Farmall® 130A and 140A tractors, as well the Maxxum® tractor series. Great for handling round bales. The longer center tine safely transports the bale and the two shorter lower tines maintains bale control. The rotating steel tubes are mounted on two powerful stone fork tines and are hydraulically adjustable sideways. During bale handling, the steel tubes roll carefully in under the bale. The bottom box section is hinged, allowing you to lock the tines in the upright position for safety while driving. Deluxe Bale Extension and Large Bag Lifter can be attached to the Deluxe Square Bale Fork for increased productivity. Transport and split bales. Both straw and silage bales fall apart in two pieces, simply and smoothly without complicated extra hydraulics. Well suited to handle round bales. The longer tine is used to safely transport the bale. The shorter tine keeps the bale from rotating. Simple, robust implement for both round and square bales. Our manure forks have specially hardened, durable bottom beam. The tines are fitted before painting the implement - metal touches metal. The tines are tightened to a very high torque. All-in-all this gives you an implement with a long service life. Potentially fill the implement without dropping any stones contained in the bucket. At the front, special downwardangled tines made of Hardox steel are installed. After many hours of work, these can easily be replaced. Well suited for smaller square bales. The implement arms distribute the pressure evenly over a large area, and this ensures careful handling of the bales. The low back plate and the long, strong base allows the driver perfect visibility to the tip of the bucket. The bucket is supplied with a powerful cutting edge. Great for handling wrapped square and round bales. The implement arms are extremely stable sliding plates, which move along the main frame. When stacking, it is possible to lock either the right or left arm, which makes for easier work. High tipping buckets are used for handling high volume materials at high levels, for example for loading grain, grass seed, beet or wood chips. Both the right or left arm can be locked independently, making it possible to stack bales tightly. The implement arms are designed so that it is easy to reverse out from the bale. This bucket series is suitable for handling grain, manure, grass seeds, wood chips and other materials with a low volume weight. The buckets have two vertical reinforcements along the implement hooks. Ideal for lighter duties, this bucket is an excellent choice. The bucket is designed for customers who value functionality ahead of technical benefits. The heavy duty buckets have thicker cutting edges, wider and longer bottom reinforcements, and an extra angle reinforcement inside the bucket next to the implement hooks. The series is aimed at users who require a large volume. The generous volume measurements are achieved by designing the bucket deeper and taller. All models have double profiles in the bottom as well as along the implement hooks. Soil bucket with teeth. Same design as Series H.
Used primarily for handling round bales, loose hay, twigs and branches, loose silage, manure, and general bucket work. Teeth, protective mesh and grapple arm can easily be removed when only the bucket is needed. Suitable for 2200 lbs, 3500 lbs and 5500 lbs pallet forks. Wide load-bearing and very stable. This implement leaves a clean cut surface in the silo. This prevents air and heat generation, critical for the quality of the silage. Primarily used for silage handling. The side ends are tapered. A relatively short base makes it easier to fill the entire bucket. This is a very powerful implement with improved cutting quality, higher strenght, and very high working speed. The close tine distribution almost eliminates the spillage of silage. The tines are mounted in a specially hardened box which does not turn or deform under load. For safe handling of large bags. The hook can easily be seen from the driver’s seat. Allows skid steer loader style implements to connect to Euro style loader quick attach devices. 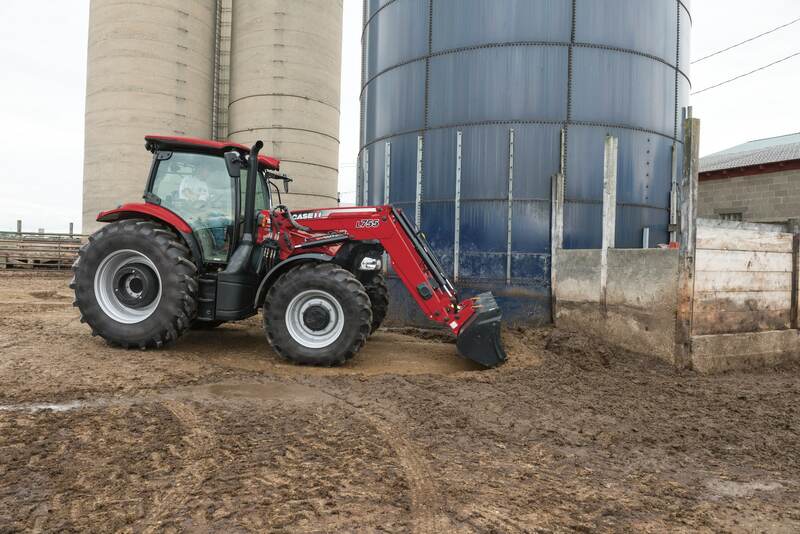 Use the counter weight to properly ballast your machine to maintain weight on the tractor’s rear axle. The coupling axle allows for easy connecting and disconnecting of the implement. This implement can be used like the tractor’s 3-point linkage to help move some implements around the farm. ​Configure and price your new L755 Series Loader. Customize it the way you want. Locate a Case IH dealer near you. ​Learn about the L705 Series Loaders.